These tongs are very unusual. They are clearly marked with London Hallmarks for 1794/95 and yet are also clearly marked with Langlands & Robertson's maker's mark. The tongs are obviously Bateman tongs, this style of tongs were very common for the Batemans. The tongs are marked right underneath the bow, exactly where the Batemans marked this style of tongs. 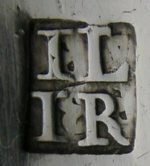 In fact underneath the "IL IR" mark can be seen the vestiges of Peter & Ann Bateman's mark. What is also very interesting is that John Langlands had died by 1793 so why was the "IL IR" mark being used a year or more after Langland's death? Given that silver will always have been marked with the maker's mark BEFORE being hallmarked, these tongs will clearly have been sent to the Assay office after the maker's mark was punched. My supposition is that they were made, and hallmarked through the Bateman workshops, in 1794 and only sometime after this sold to the Langlands/Robertson shop are then over-struck. Even supposing this, it is still unusual that they should still have been using an "old" maker's punch.